The STS-117 crew aboard the shuttle Atlantis took this image of the Internatinal Space Station after a June 19, 2007 undocking following the installation of new starboard solar arrays and trusses. NASA ispressing ahead with plans to use part of the International Space Station (ISS)as a national laboratory, a move that would reserve about half of the outpost'sU.S. science facilities for outside use by 2011. The planhinges on the completion of the half-built $100billion space station by September 2010, when NASA's shuttle fleetis due to retire, the space agency said Monday. "What we're trying to do is open up the U.S. segment of thespace station to be utilized by a variety of folks, both governmental and maybecommercial, in the future so that we can take the maximum advantage of thespace station that we're in the process of assembling right now," saidBill Gerstenmaier, NASA's associate administrator for space operations, duringa teleconference with reporters. In lateMay, NASA presented Congress with a 14-pagereport detailing the agency's plan to use the U.S. segment of the ISS as anational laboratory as directed under the NASA Authorization Act of 2005. NASA andits international partners plan at least 12 more space shuttle flights tocomplete ISS construction by 2010. Still awaiting launch to the station are theEuropean Space Agency's Columbus module, Japan's three-partKibo laboratory, additional Russian-built modules, as well assupporting solar arrays, connecting nodesand other hardware. "Previously,we had anticipated that all the research conducted on the station would beresearch within NASA's mission portfolio," said Mark Uhran, the spaceagency's associate administrator for the ISS. "Now what we're looking todo is make the facility available to other government agencies or private firmsto pursue their own research interests." NASA'srestructuring in recent years, which shifted away from earlier ISSscience efforts to a more focused exploration program to support theplanned return of astronauts tothe Moon, led to the surplus of science time available aboard thestation, space agency officials said. The level ofinterest among non-NASA agencies to use the ISS could ultimately decide howlong the space station remains in operation beyond its current 2016 designlifetime, they added. "Technically,the space station could fly to 2020 or 2022," Gerstenmaier said, addingthat a decision on whether to extend the station's lifetime would have to bemade around 2014. "What really drives the practical lifetime of the spacestation is how useful it is and does it fit a niche." Whencomplete, the space station's pressurized U.S. science facilities will includethe 12 experiment racks inside NASA's Destiny laboratory already in orbit, aswell as five others inside both the Columbus and Kibo laboratories. NASA hasalso reserved about five payload slots on the Kibo laboratory's porch-likeexposed platform and has room for science experiments on other U.S.-builtexternal cargo carriers. About halfof all those U.S. assets are expected to be available for use by privatecommercial enterprises or non-NASA government agencies, Uhran said. Sciencepayloads will be skewed to include more automation, since the amount of crewtime available for non-NASA work remains to be determined, as well as focusedon experiments that return data only, rather than require a return trip to Earth,he added. While NASAwould continue to assume the current operational and maintenance costs of theISS, as well as those to launch astronaut crews and cargo, national laboratoryusers would be responsible for the cost of their payloads and research underthe current plan. The anticipated cost of NASA's ISS operations once thestation is complete is estimated at about $1.5 billion per year, Gerstenmaiersaid. 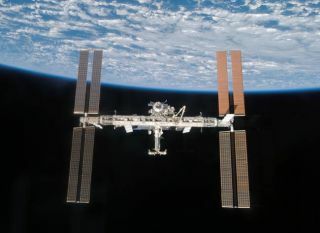 The spaceagency is also relying on the anticipated availability of private launchservices to the ISS, such as those sponsored by NASA's Commercial OrbitalTransportation Services program, as well as the station's planned expansion toa six-person crew in 2009 to maintain the orbital laboratory. "Thesuccess of this plan does clearly rely on being able to reach a six-personcrew," Uhran said.